There’s something amazing about juicy grilled chicken with super crispy skin. Well, there’s also a really easy way to do it that involves something you might not think as a cooking tool. Cooking chicken under a brick sounds a little strange, right? It really makes sense though when you think about pushing the skin into the hot grill or pan. You can either cook the chicken directly on the grill (like I did), or make brick chicken in a heavy cast iron skillet. Either way will work great, but you get all that wonderful smoky flavor when cooking the chicken directly on the grill. 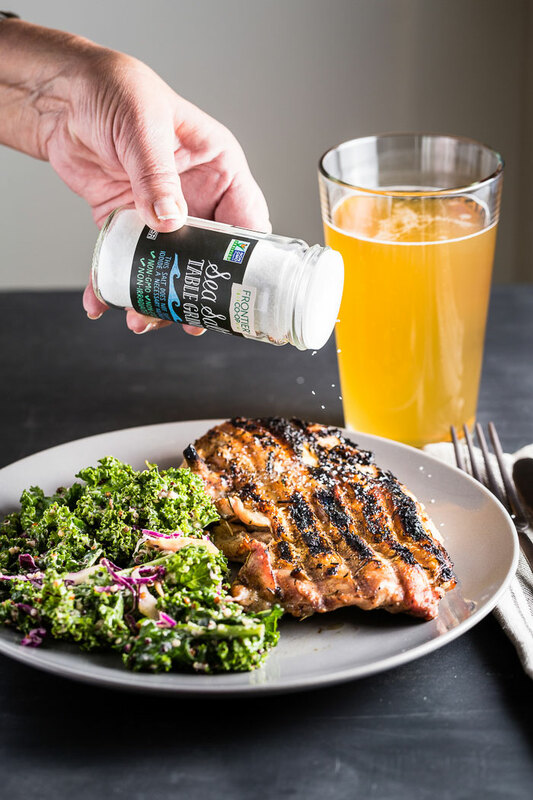 I have partnered with Frontier Co-Op, the maker of the great tasting pure seasonings that I used in this recipe. 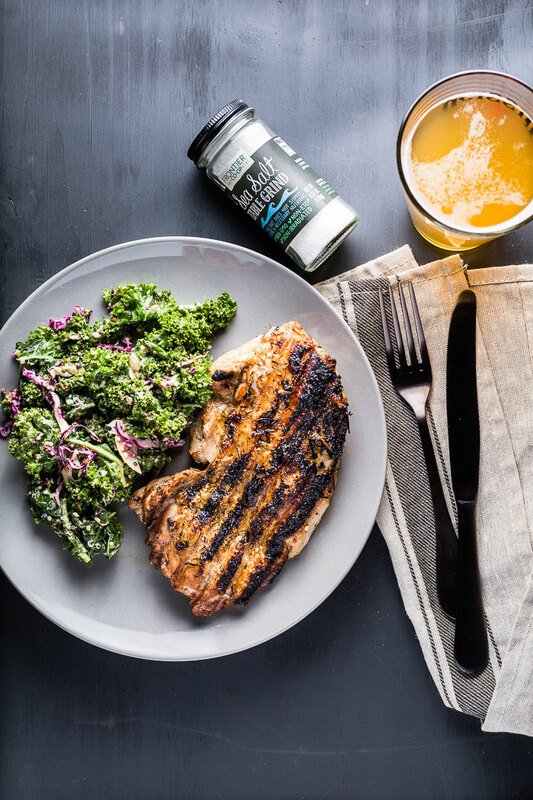 When you season your food with good quality sea salt and organic rosemary, the natural flavors of the grilled chicken are brought out to the front. Why grill chicken under a brick? The skin gets extra crispy and the chicken cooks more quickly and evenly because it is slightly flattened and that makes it thinner and cook more quickly. The result is super moist and tender chicken that has a lot of flavor. Alternatives to using a brick: If you don’t have a brick and don’t want to make a trip to your local hardware store, you can use a heavy cast iron skillet to do the job. You can split the chicken in half and remove the back bone. but I find it a little more elegant to eat if I break it down to just the breast and the thigh. Also, since this chicken isn’t going to be cooking for all that long, I really don’t think that the bones are going to add much flavor. For that reason, I just cooked the breast and thigh. 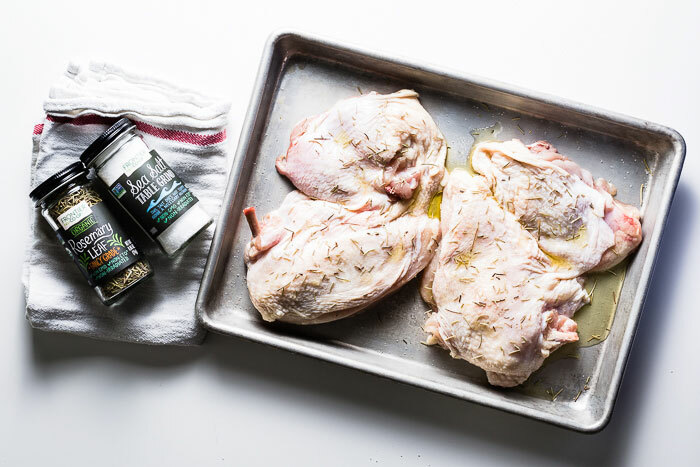 Drizzle with olive oil, sprinkle with dried rosemary and salt on both sides of the chicken. It might be pretty obvious that I think salt is one of the most important ingredients. After all, it is the first word in my site’s name. All salts are not created equal. Each type of salt, and even different brands, have different flavors and contain different levels of sodium. Learning to season your food properly is probably the biggest game changer to elevate your cooking skills and quality of finished dishes. You don’t want to just salt at the end. That can result in a dish that tastes “salty” on the outside, without much flavor on the inside. You should progressively season with salt at each stage of the cooking process. 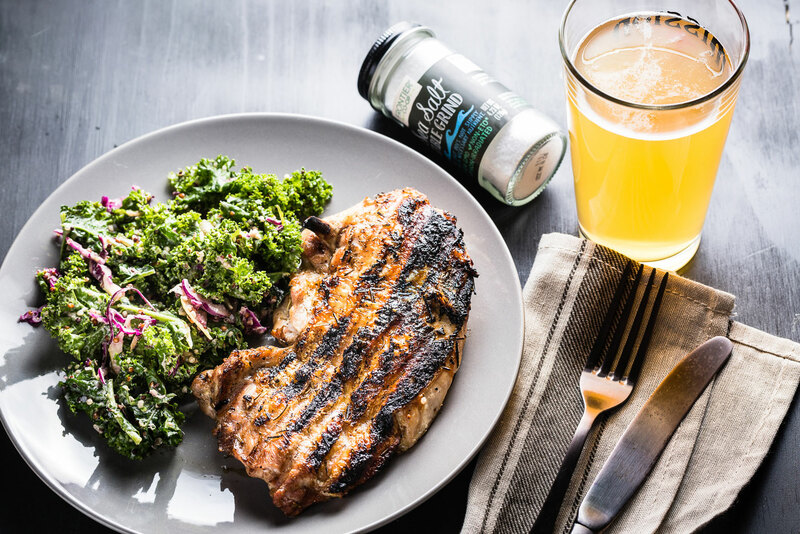 When the food reaches the plate, it probably won’t need any more seasoning. 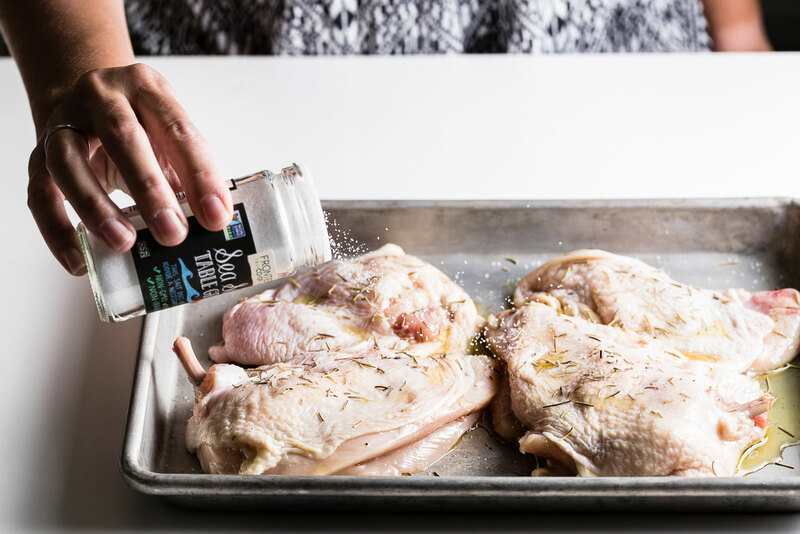 When should you salt the chicken? When you salt is really important, and it depends on how much time you have to let the chicken sit. If you have at least a few hours (which I would recommend), then salt your chicken early and let it rest with the salt and other seasonings. Seasoning the meat properly is important, but it still won’t get to the inside of the meat with the short amount of time that it will be on the grill. That’s where seasoning ahead comes in, but the timing is really important. When you add salt to the chicken, it will draw moisture out. 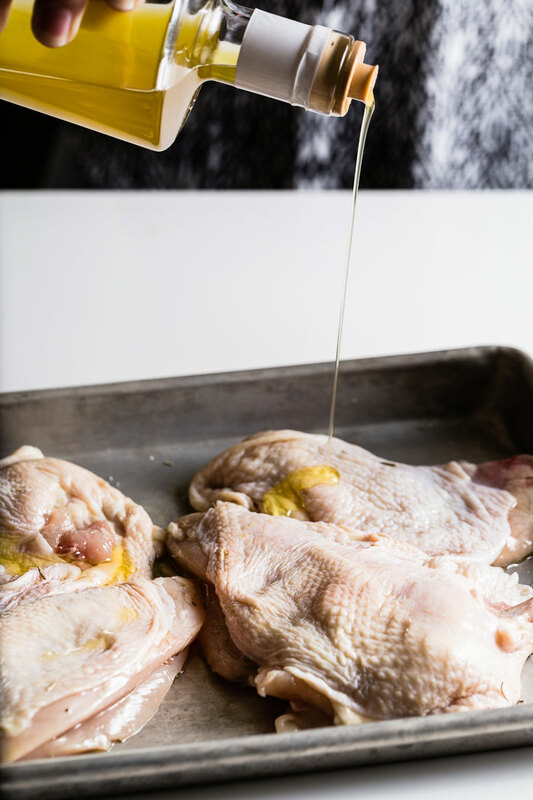 If you were to cook the chicken when this moisture is sitting on the surface, it would steam instead of sear; resulting in a not so crispy skin. You don’t want to season 20 minutes ahead. Seasoning well ahead will allow the salt to be absorbed with the moisture and that brings rosemary with it and a little olive oil too. Pretty cool, right? Cover and place in the refrigerator for at least 2 hours. 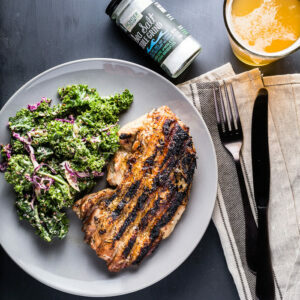 I prefer to serve grilled chicken with something that is light and fresh, like a kale salad with a lemon dressing. This post is sponsored by Frontier Co-op. All opinions and thoughts are always my own. Break down the chicken into halves, and remove the backbone or all bones if you prefer. 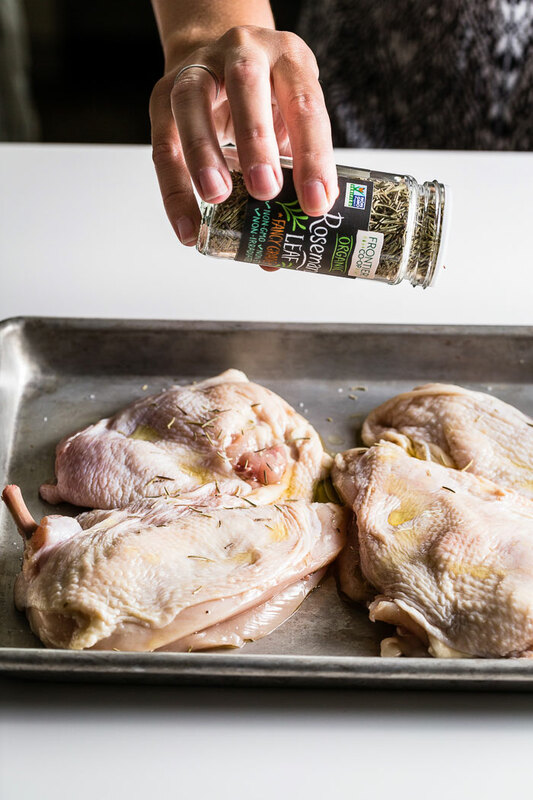 Drizzle olive oil over the chicken, then season the both sides with Frontier Table Grind Sea Salt and Frontier Organic Whole Rosemary leaves. Rub the seasoning in, then cover and refrigerator for at least 2 hours. Place the chicken skin-side down on the direct heat of the grill. Place two foil-covered bricks on top of the chicken. Carefully monitor to make sure the heat doesn't burn the chicken. Flip the chicken and move to indirect heat after 10 to 15 minutes when the skin is crispy and golden brown. Cook for an additional 10 to 15 minutes, or until the chicken is cooked through. Cooking times vary depending on the size of the chicken, if it has bones and the temperature of the grill. Move the chicken to a cutting board and let rest for 10 minutes before serving. 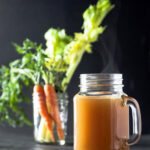 Delicious recipe and I really love how you use the artificial light. You make look SO perfect! Excellent! I would love to see the tutorials. Please keep me update it. Crispy chicken is my favorite! I will be making this for my family tonight! I never thought of grilling chicken under a brick, good idea! Half of the fun is in the name and talking about it at the table, but it really does work. Cheers! Chicken under a brick. Interesting. I will have to give a try. Thanks for making that delicious meal for my birthday, Justin. I LOVE crispy chicken!